OneWire lets you access 1-wire devices made by Maxim/Dallas, such as temperature sensors and ibutton secure memory. For temperature sensors, the DallasTemperature library can be used with this library. OneWire communicates with 1-wire devices. 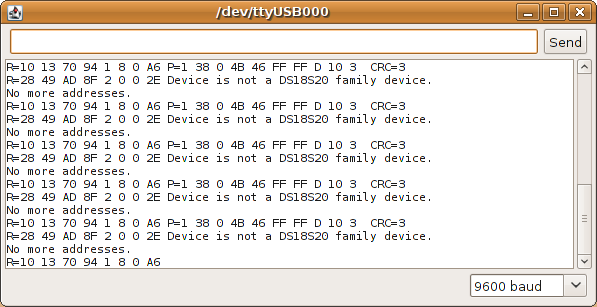 To act as a 1-wire device, use the OneWireSlave library. You can open the example code from the File > Examples > OneWire > sample menu. Weather Toys - community using 1-wire devices. "RJL20" added the skip function. Robin James rewrote the search function, posting his version here. Paul Stoffregen rewrote the I/O routines for interrupt safety, replaced search with Robin James's code, applied several small optimizations, and started calling it "version 2.0" to distinguish from the many buggy copies online.